OTR Tires at Pete’s Tire Barns. We are able to service OTR/Earthmover tires in the field by one of our certified OTR Tire Specialists operating our specialty Boom Trucks outfitted for such jobs. Each of our 19 locations is backed by one of New England’s largest inventories of tires for rigid and articulated trucks; scrapers; loaders; graders; wheel dozers; underground haulers; wheel excavators; backhoes; skid steers and forklifts. We are capable of repairing most OTR/Earthmover tires in under a week or less. 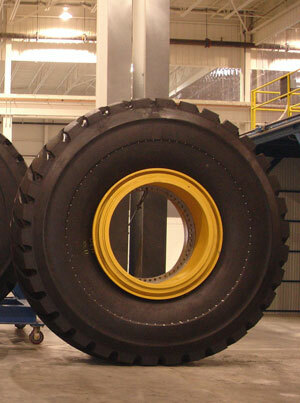 We offer retreading in our own state-of-the-art Bandag retread facility. We have also started to offer large tire retreading through a contracted source. We also offer urethane fill to flat proof your tires to eliminate down tire, usually with a 2-3 day turnaround. We offer a large inventory of used OTR tires with outside diameters and tread depth for matching remaining tires on your machines. This is particularly important in not damaging the planetary gears of rear ends. We have 19 locations to service all of your OTR tire needs. Call your local Pete’s Tire Barns today and schedule a visit from one of our construction tire experts.